House and warehouse, the house now part of a store. Circa late C18 or early C19 house and circa mid C19 warehouse. House has header bond brickwork with left-hand ridge stack, tiled C18 valley mansard roof partly extended (by one window) to the left, and stretcher bond brickwork to warehouse with gabled slate roof Double-depth plan house, with short entrance bay connected to warehouse set at right angles to left. 2 storeys and attic; 3:1:2-window range. C18 right-hand house has corbelled eaves extending across the central section, a right-hand round-arched doorway with a 4-panel door, inserted central opening and left -hand round arched wider doorway with an inserted doorway, and first-floor cambered keyed heads to C20 casements. Gabled warehouse has round-arched openings to 3-window front, a wider central doorway and hoist doorways above, with small windows each side and a diaper pattern in the gable. Two 12-pane sashes at rear of house. The roofline and cornice extend across the central section, although the brickwork changes between middle and left-hand bays. INTERIOR: House has circa early C19 dog-leg staircase with stick balusters, moulded handrail and turned newels and in rear first floor room a cupboard with fielded panel doors and a simple moulded chimneypiece. The warehouse has dog-leg staircase in front left corner with stick balusters and roof with queen-post trusses. 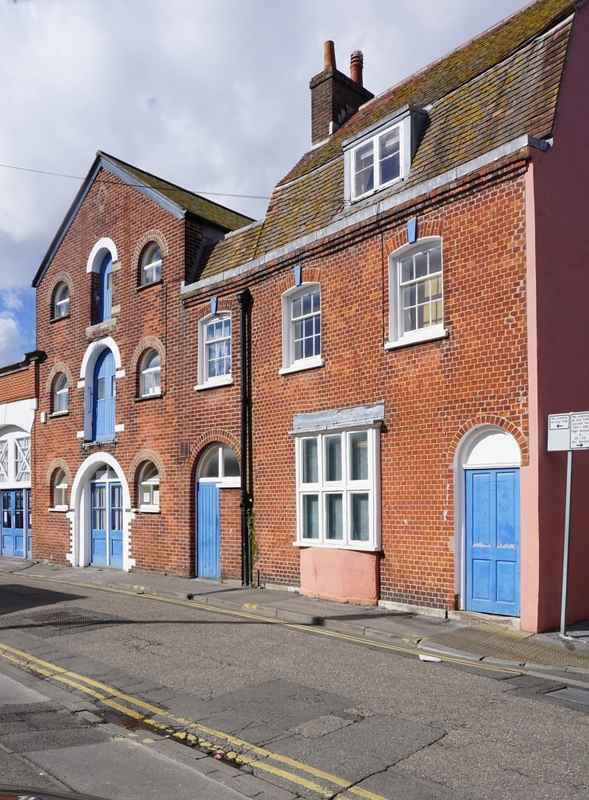 A good surviving example of a house and attached warehouse, exhibiting the former commercial importance of Poole. (RCHME: County of Dorset (South East): London: 1970-: 226).